For its 25th edition, the festival took place at l'Espace EFCB of Montreuil where we had two projection rooms and a large space combining the cafeteria, the associations and lesbian creations stands, the art exhibition, debates and meetings. In spite of the three-day weekend the number of members (1286) slightly decreased (- 5.4%) but they were more numerous to subscribe to the support membership. Because of the limited capacity of the rooms (320 and 120 places) we proposed a single rate per screening which undoubtedly proved dissuasive. The total number of entries was only 3949, that is to say 24% less than 2012. The selection presented 99 films from 29 countries. The most popular screenings presented a rich and varied program: in the large screening room, two illustrated conferences, Elles Sapphichent, on lesbians in TV programs from the 50s-60s (317 entries), and Le Point G by Deborah Sundahl (190), the full-length fiction films Route of Acceptance (271) and Stud Life (252), the short screenings "Courts mais cultes" (225) and "Des rives, des continents" (216); in the small screening room the documentary and activist programs "Kenya, générations féministes" (117), "Lesbians en marche" (105), No Job For A Woman (101), Wonder Women (91) as well as the fiction feature film which tackles the trans-sexual question Facing Mirrors (87). Taking into account last year's deficit, we appreciably reduced the organization costs (- 15%). That was not enough however to re-establish a financial balance because of the drop in attendance and membership, in spite of the strong mobilization of festival-goers in the form of donations. 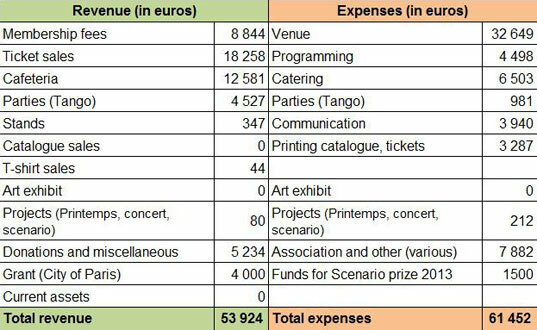 The savings came mainly from the venue and equipment rental, while the programming expenditure remained stable in order to maintain the quality and the diversity of the films proposed at the festival and to continue to support the film directors.